It seems to me that our politics have become just such a game. We tug our way from one election cycle to the next, and the winners savor the abject humiliation of the losers. 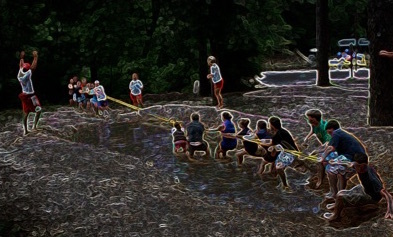 Increasingly, we seem unable to give up the tug-of-war between election cycles for a circle of rope that connects us all as equals. On this Memorial Day, as we remember those who died while serving our country in the armed forces, I think about the freedoms I have that these women and men gave their lives to protect. For most of our history, this country has been the winner in wars that were fought for what was right and just. For most of my lifetime, though, the causes for which we’ve fought in wars seem murky at best. Why were we fighting in Vietnam? Most of us were never sure, and we certainly didn’t win that war. And our wars in the Middle East? Are they about stamping out terrorism? Or are they about gaining control of the oil that scientists say will eventually destroy our environment if we don’t find more sustainable means of harnessing energy? Most veterans trust that they are being sent into harm’s way for valid reasons. Even when we haven’t decisively won the wars of my lifetime, the veterans I’ve known have believed they are serving our country honorably. They speak about the children they encountered in Iraq and Afghanistan and their hopes that their service will mean those children will have a better life. We owe it to these veterans, and especially to the ones who’ve lost their lives, to make our politics better than a tug-of-war. As a diverse people we will never agree on issues that both sides see as moral imperatives with completely opposite views of what is right. The only way for democracy to work is to recognize that we must sometimes give up fighting to win—fighting to achieve the total extreme that is acceptable to only one side—for a middle ground that works for the common good. If we continue to pass laws that are acceptable only to the half of the electorate that is in power, we will never get past this tug-of-war where the other half of the electorate must endure the jeers of the winner until they can pull their backsides out of the dust. Instead of allowing our leaders to gerrymander districts to give an unfair advantage to those on one side of the rope, we must demand an equal voice for that small person at the end of the rope—the one who is only considered once the chosen ones have gained the positions of power. If we believe in democracy, we must stop treating our politics as we treat our wars—as a game of strategy where the end justifies the means and where the only acceptable win is the one that obliterates the opposition. To do less is to dishonor those we remember on this Memorial Day. Previous PostImages of Beautiful Babies in Syria and at HomeNext PostCan Christians Change the Climate on Climate Change?